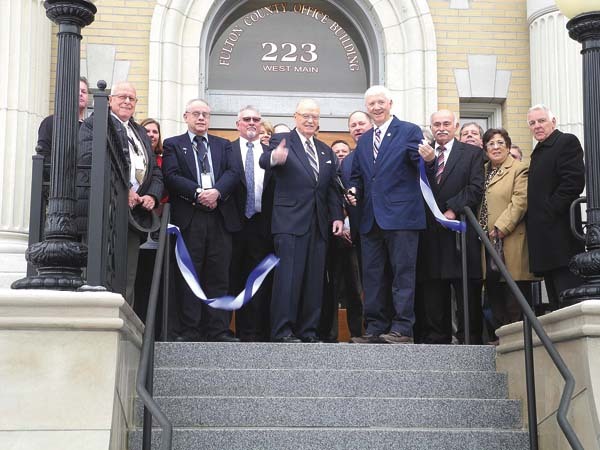 JOHNSTOWN — Fulton County government on Tuesday celebrated a grand reopening project for the front of the County Office Building with a “special guest” who helped provide most of the funding for the $500,000 project. 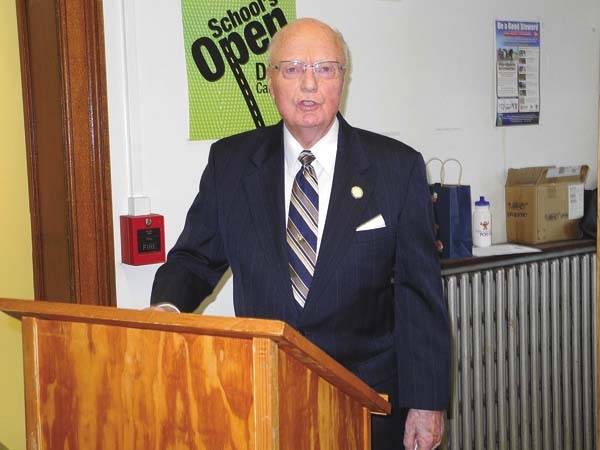 Former state Sen. Hugh T. Farley of Niskayuna was on hand — along with several county officials — for a ribbon-cutting ceremony marking completion of the first phase of the renovation project. “One of the great joys of my life was representing Fulton County,” Farley said. The ceremony was held both inside and outside the main entrance at 223 W. Main St. Work done there was a major component of the first phase of an overall $500,000 County Office Building exterior renovation project. Work has been ongoing since the summer. The project rebuilt the main entrance to provide better access, more safety and adapt a new handicap accessible ramp to better serve the public. A second phase will begin next spring. Farley obtained a State and Municipal Facilities Grant of $450,000 to largely make the project feasible, with the balance of funding coming from county capital improvement reserves. “My grant really got its money’s worth,” Farley told a gathering, just inside the building. County Administrative Officer Jon Stead detailed the history of the project and what the second phase will entail. He said the county seat, which is Johnstown, and the building that represents it is very important in the promotion of Fulton County. He said similar work will begin next spring on the county Family Court front entrance side of the project on North William Street. Stead said the new granite stairs in front of the County Office Building “look wonderful,” and the work was a major repair of structures that have stood for 100 years. “It probably looks a lot more like it did in the 1700s with Sir William Johnson,” he said. Stead also mentioned the new “historic walkway” to the right of the main entrance, which chronicles famous inventors, the historic Fulton County Courthouse, Johnson, the Fort Johnstown Annex, and women’s rights with Johnstown native Elizabeth Cady Stanton. For the second stage of the project, Stead said sidewalk work will be extended north on North William Street to the county Office for Aging/Youth building. He noted retiring state Assemblyman Marc Butler secured a separate $100,000 grant, which may be used to spruce up parts of the courthouse. Stead credited Farley for the overall project, saying the county “couldn’t have pulled it off” without his help. He said the county had looked at doing this renovation for several years, but it was finally brought to fruition. Stead also thanked the “vital” help of the county Planning Department, especially former department Director James Mraz. “We wouldn’t have gotten it done the right way” without Mraz, he said. He also credited Johnstown Mayor Vern Jackson, the county Highways and Facilities Department, R&B Construction of Amsterdam and Steven Smith Engineering of Gloversville.